Street Map of Greater Miami Dade County, Fla. This is a beautiful 1945 pocket map of Miami, Florida, published by Karl Squires Engineers and issued by the American News Company. The map covers greater Miami from Coral Gables Canal north as far as the Miami Beach fishing pier, and from Tropical Park east as far as the Atlantic Ocean. Includes Miami Beach, Coral Gables, South Miami, Miami Shores, North Miami, Hialeah, Opalocka, El Portal, Biscayne Park, Surfside, Indian Creek Village and part of North Miami Beach. The map is extremely detailed and notes streets, railways, canals parks, piers and important landmarks. City limits are shown in green. Verso includes a street index of the city of Miami, Miami Beach and Coral Gables. 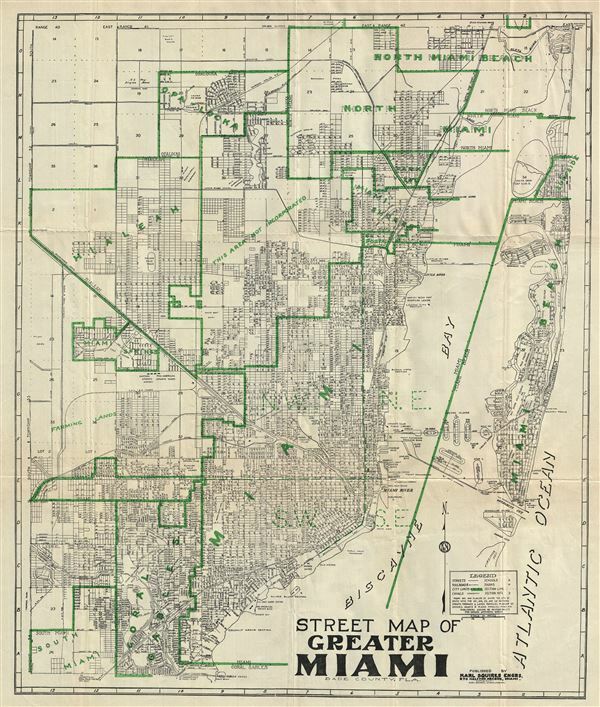 This map is the 1945 edition of the Street Map of Greater Miami, Florida, published and copyrighted by Karl Squires Engrs., Miami, Florida and issued by the American News Company. Very good. Minor wear along original fold lines. Folds into original paper binder.